Available in one size. European 4-1 Weave - One Flat Wedge Riveted Ring to four Solid Rings, mild steel with a ring size of 9mm Internal Diameter. Which makes for a very strong build. Perfect for most periods where coifs were worn. All Cap-à-pie coifs have a large mantle, which also makes it an ideal bit of kit for modifying for an Aventail on a helm. Like all of our maille, in terms of total weight it is comparable to original items and lightweight compared to other products on the market. 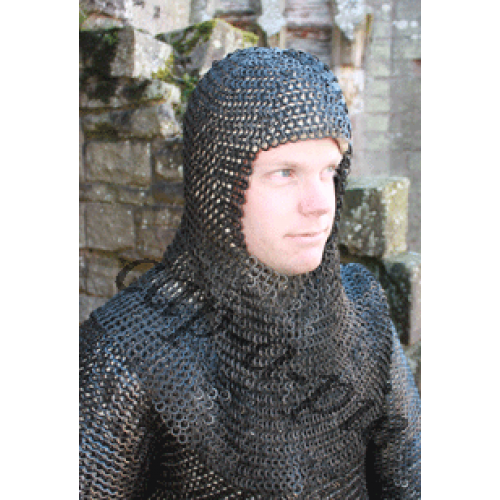 Our Blackened look, with wear over time, dulls down to a grey finish which is comparable to some examples of original maille. Do you have any questions about Wedge Riveted Coif?